The development of Telluselle Living Center started off as my own interest in wellness both out of need and curiosity. In 1998 while I worked as a professional copywriter in advertising, I provided a supplier for natural supplements with texts for their exhibition material and corporate presentation. In 1999 I took a three month course in Project management for cultural performances at Folkuniversitetet in the south of Sweden and this is where the idea to start my own coaching business was invented. I called it “The Gazebo” and had in mind a type of mall for health related services, rather than stores, and presented it to Patrik Arlesäter, the founder of Forum fitness club in Malmö, Sweden, who was just about to expand his business with similar ideas. He became a little like my new business mentor. He offered me an assignment in 2000 to write and be the editor for their promotional wellness magazine to their members, while I took my Bachelor’s degree in Behavioral sciences (Workscience with a focus on competence development) at Malmo University. Much of my previous practices in Qigong and personal development, alongside my education came to be a source for my writing, together with making feature stories about health profiles and articles about spas, personal development etc for four whole issues. I also received free training and began to exercise more by lifting weights and practice Body Balance, which later turned into Power Yoga. I still do yoga. 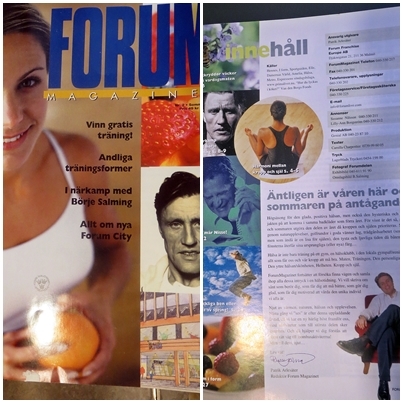 In late fall 2001 I started my own coaching practice called Balansfokus, with a popular newsletter to about 100 subscribers. My writings were about a variety of themes and topics, inspired by Cheryl Richardson. I did some public speaking and held coaching sessions both for small groups and individual clients through Drivhuset at Malmö University where I also presented a professional paper about this new upcoming profession in 2002-04 alongside a development plan for including coaching in their career center. After tending to a family emergency, I went to Hawaii 2004-05 where I studied at a university and was introduced to Hawaiian Hula. Upon my return to Sweden, I started performing and offering dance classes which also was incorporated at Forum for a summer session. Unfortunately some of the CEO’s employees made a hostile takeover, and I wanted to focus on dance rather than yoga, so I moved on in 2007 and looked into starting up my business as a night class type of enterprise in collaboration with a similar organization, called Sensus in Stockholm together with meditation teachers and healers, while I would be the coach, but none found out to be trustworthy. I moved back to Hawaii in 2010 to finish my Master’s degree and deepen my skills in Organizational Development (with culture and motivation as my main focus). Back in Honolulu I came into contact with Kanu Hawaii, a community organization focusing on environment and compassion, I developed my business plan further with a sharpened eco-friendly approach and business model, while I also met with an architect who can design the house according to my vision. I also connected with Holistic Honu Wellness Center in the Berkeley area to seek collaboration, alongside Pranic Healing through Unity Church, Still and Moving Center in Honolulu, independent Lomilomi practitioners, Kirtan groups and others in 2011, after I had finished translating and editing my first coaching-book into English. Since I was forced to leave the United States in 2012, this was put on hold here, while I decided to find new interesting people in Stockholm to see if we could meet and start working together after all. I went back to African dancing for a while and found my own preferred dance style Isadora Duncan in 2014. I started practicing Qigong with a new routine and tried another Buddhist mantra, as well as attending Catholic Mass and international Bible study groups to be able to discern and differentiate my own activities properly from that of a church. Meanwhile I had also come up with the idea of making a bamboo lei and wrote my second book in English about my detention, hoping that it will gain enough attention as a beginning point of being allowed to participate in a discussion about immigration in the media, also worldwide. In 2015 and 2016, however, I was abruptly hindered again by stalking and slander and thefts of my intellectual property which now had grown into larger scale as I made it public to stop the offense and have my own say, but continued developing my graphic design etc. Right now, since two years I am focusing on the core of my part of the business idea, which is to offer coaching sessions and practice dance while providing an international forum for meetings that can create a place for think-thanks, support groups, coaching with other activities such as nature based dances, qigong, workshops, body therapy and organic café, when the house is built. Location, however, isn’t set yet. If Telluselle Living Center is built in Stockholm, I would put it up next to KTH by Ugglekällan (Owl’s spring) if possible but I would prefer San Francisco as the original plan was in 2010, or in Lisbon, Portugal.